We offer fine Belgian chocolate molded in very attractive shapes. Choose any shape from our collection or get your exclusive shape designed. 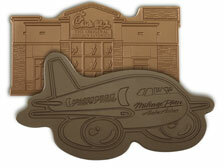 You can have your new product, company building or any other design shaped in milk or dark chocolate. Each piece is 9” x 5” x 3/8” in size and comes packaged in an elegant gift box.